Are you interested in having Solar Transport manage your company's inventory? Solar's inventory control system is designed to control the next delivery. That means we keep you at your most efficient levels so you never run out. Our team strives each day to improve the Solar delivery system in order to better support our clients. This includes professional training for our team and integrating a technology suite that utilizes the best of TMW® transportation software coupled with PeopleNet Mobility Solutions. 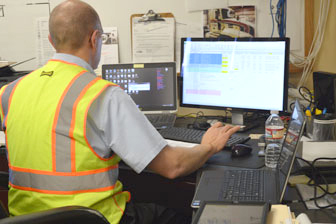 Our advanced technology suite allows us to control inventories, track arrivals and departures, and give our customers information that helps them better manage their business. With over 50 years experience in hazardous materials delivery, Solar has emerged as a leader in the delivery of refined petroleum products to c-stores. Our customer portfolio includes premium brands such as Circle K, Murphy USA, Hy-Vee, Marathon, Rickers, PDQ, Kum & Go and CST brands. Solar's inventory control system is designed to keep you at your most efficient levels so you never run out. Flat organization with 24 / 7 / 365 individualized customer care. Focused on product integrity, security and transportation safety. Surge capacity strategies including select rapid response team (RRT) to add flexibility in start-ups or seasonal peak periods. 98.92% on time delivery rate. A proven, seamless start-up process allowing the customer to focus on core business priorities. Provide quarterly management meetings to review Solar's performance, key performance indicators, and identify areas where Solar can provide greater support. Driver retention program designed to keep our seats filled with experienced, professional and dedicated drivers familiar with your business. Smith System Defensive Driving to keep everyone safe.